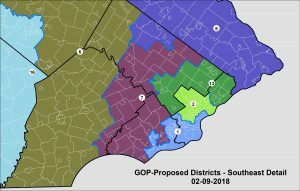 On Friday, Feb 9th, just hours before the court-imposed deadline, Senate Pro Tempore Joe Scarnati and House Speaker Mike Turzai submitted a new Pennsylvania congressional map to Governor Wolf. 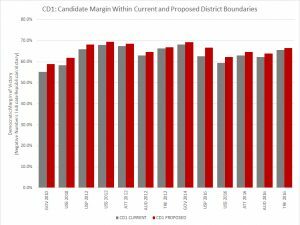 While many legal and political questions remain, here is a deep dive into the districts they drew. 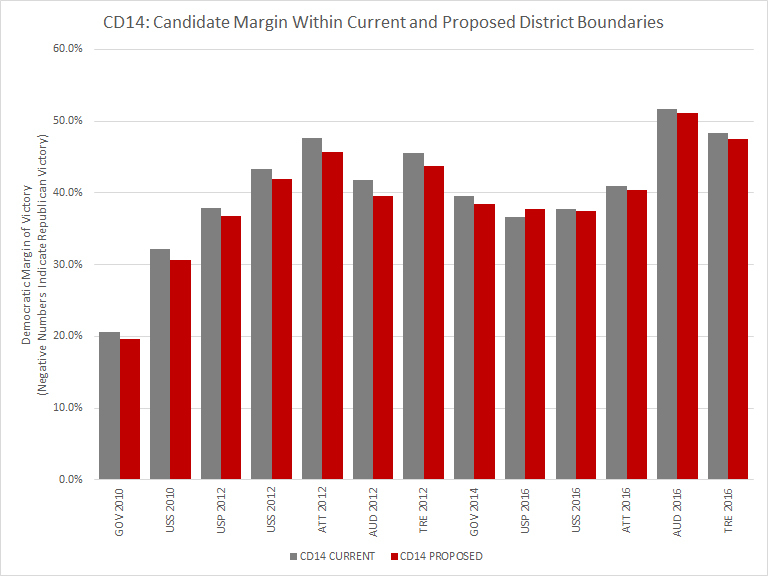 Senator Scarnati posted a PDF of that map on his website, which made it possible to take an initial look at the proposed districts, compared to the existing ones, relative to voter registration and past performance numbers. The technical note at the end of this piece describes the process used to make these estimates and a few points regarding their precision. 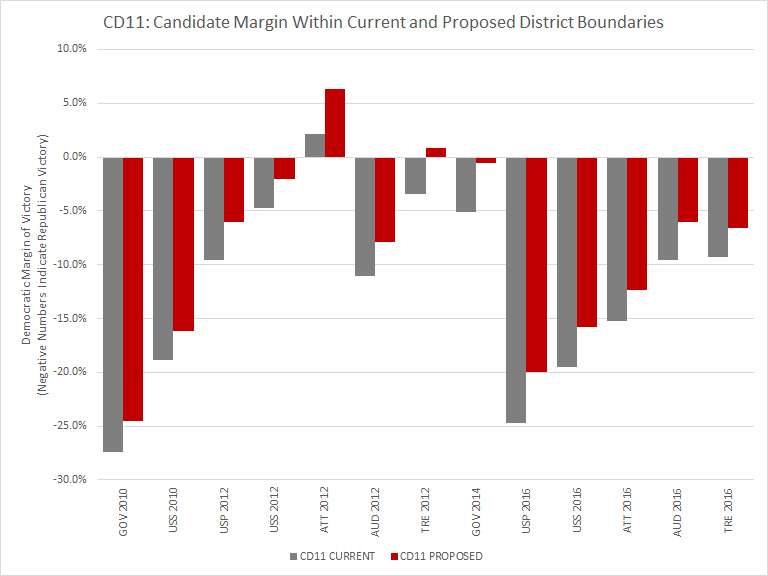 Figure 1, above, shows how a generic Democrat or Republican may expect to perform in the proposed GOP map versus the current districts. It aggregates results for all statewide elections in 2014 and 2016 within each district, and averages them together. Overall, nine of the proposed districts would have performed more Democratic on average and nine which would have performed more Republican. 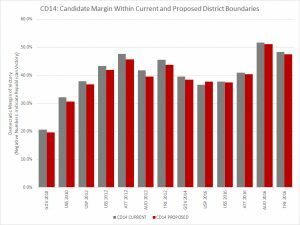 Districts 1 and 2, which were already overwhelmingly Democratic, would be even more packed under the proposal. The open seats in the 7th and 15th would become more competitive under these new lines. 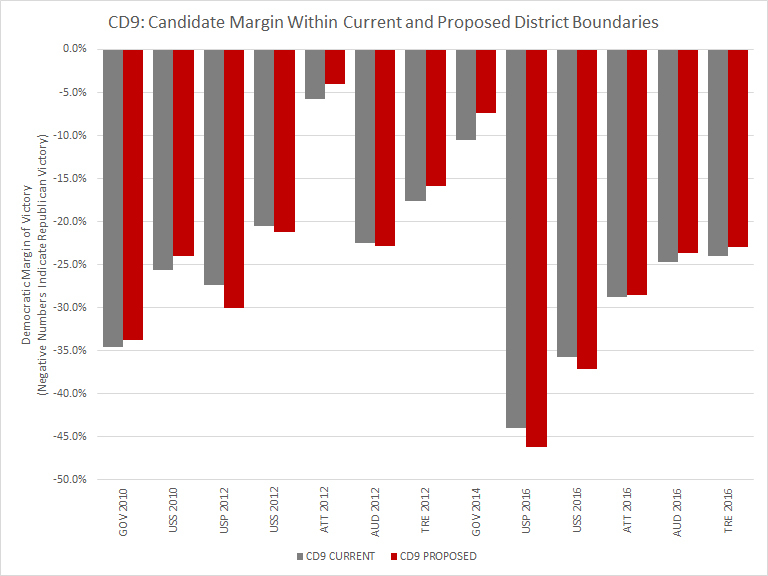 The the 6th and 16th districts would be protected for the GOP. The 18th was also made safer for Republicans under this map – and not just because it moves Democratic special election nominee Conor Lamb out of the district. The proposal shuffles Republicans from the 12th district, which sees its GOP majority cut in half. 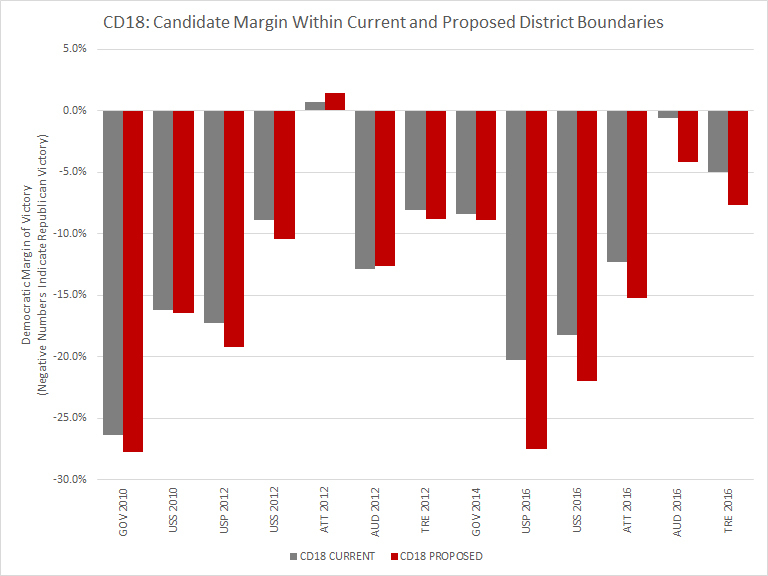 As the district-specific graphs below show, Donald Trump won 12 congressional districts under the current map and also would have won 12 districts under the Scarnati-Turzai proposal. Governor Tom Wolf won 8 districts under the current map; he would have won 9 under the Scarnati-Turzai proposal. Figure 2a below shows the proposed map with added detail of municipal boundaries. Figure 2b is a detailed look at the southeastern portion of the state, focusing on districts 1, 2, 7, and 13. 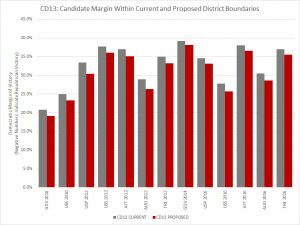 Note that Montgomery County, the third most populous in the state, is still split between several Congressional Districts. 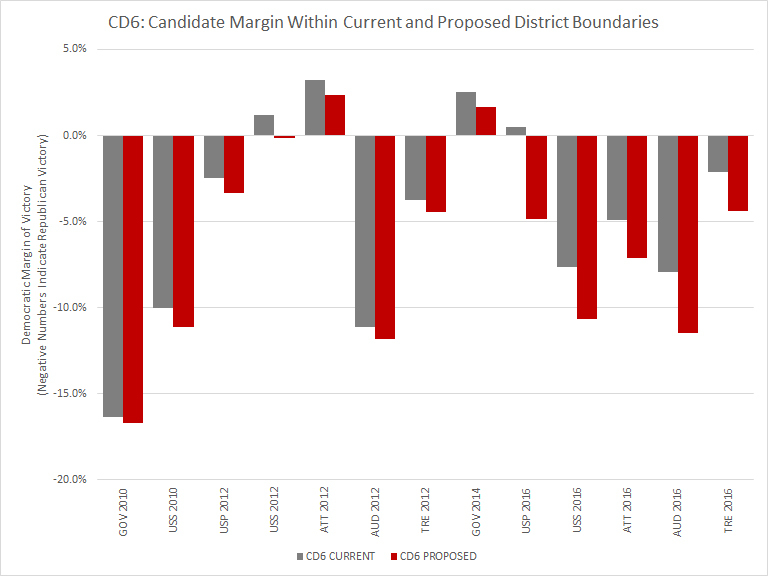 The following 18 charts show individual candidate performance in each district, represented as a Democratic margin of victory, for statewide candidates between 2010 through 2016. 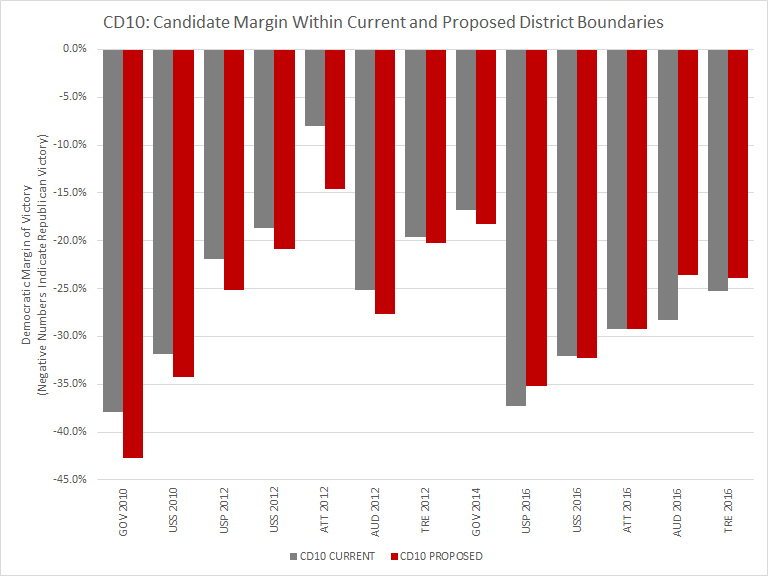 The grey bars represent the margin of victory in each congressional district under the current lines, and the red bars indicate the estimate of what their margin of victory would have been in each district under the proposed district lines. USS = U.S. Senate; USP = President; ATT = Attorney General; AUD = Auditor General; TRE = Treasurer. 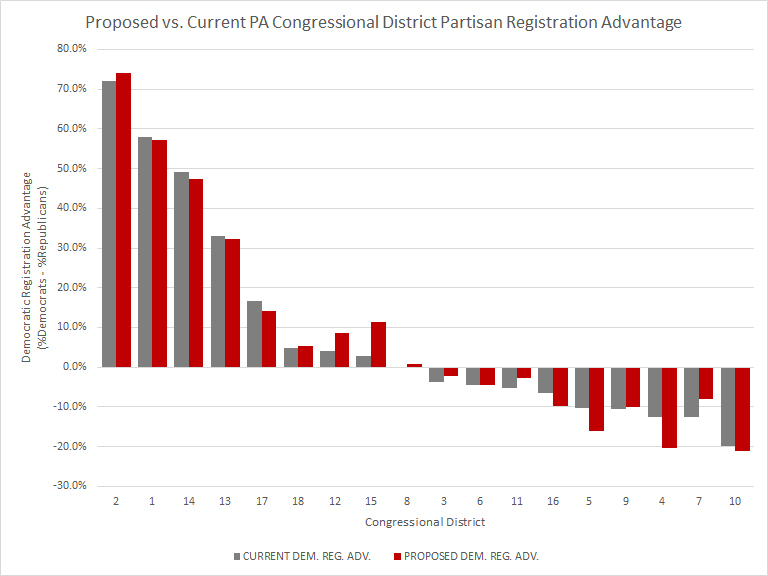 Finally, Figure 3 shows the voter registration statistics estimated under the GOP proposal, compared to the current map. 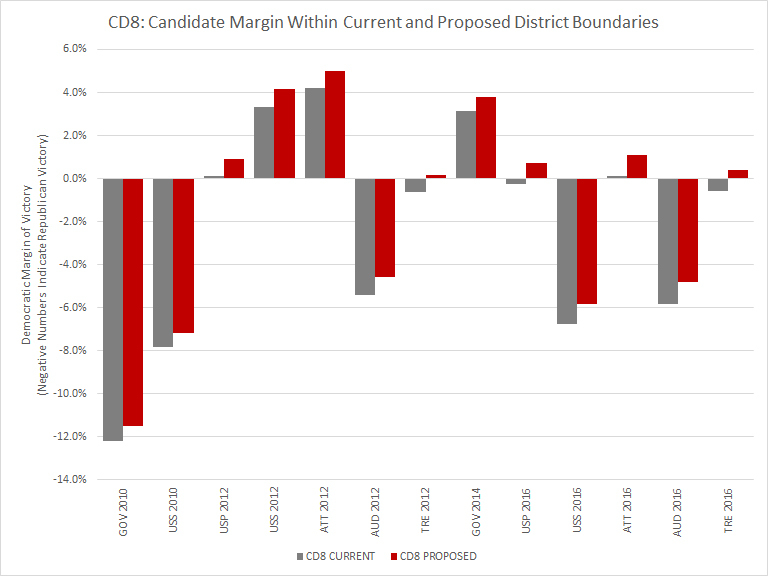 Districts are ordered from left to right on the chart based on decreasing Democratic registration advantage under the current Congressional District boundaries. While the registration statistics can be interesting to look at, they should be examined cautiously given the sizable and fairly reliable gaps between registration and performance, particularly in the southwest and southeast. 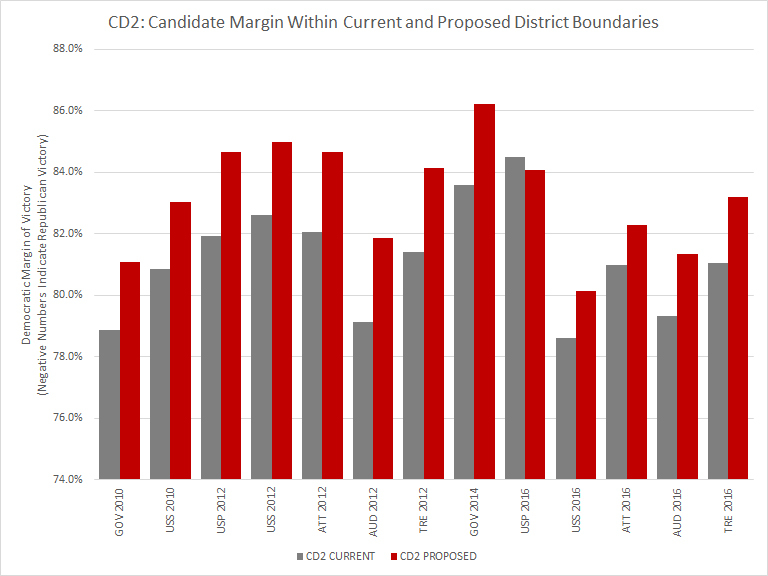 For example, looking at just the registration statistics, one could assume that CD12 is a reliably Democratic Congressional District, and that CD7 is more reliably Republican than any district other than CD10. 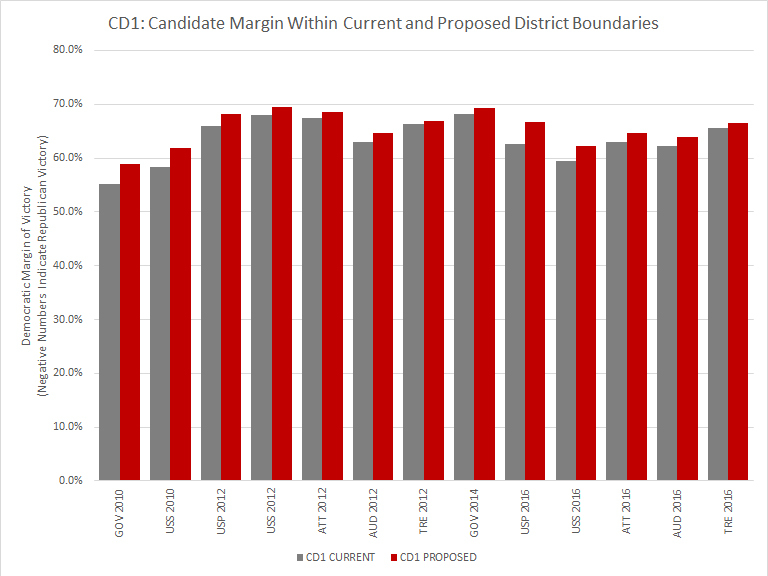 As you can see in the charts for each of the districts that follow, these registration numbers alone do not define the partisan performance of these districts. Matching municipalities to the proposed Congressional District boundaries: By opening the PDF map on Senator Scarnati’s website in Adobe Illustrator, I was able to remove the layers containing the labels and county lines, and reduce the map to just the precise outlines of the proposed congressional districts. By exporting those lines to an AutoCAD DXF format, I could open them as vector art in ArcMap GIS mapping software, and use a georeferencing tool to line the proposed district boundaries up precisely on a municipal boundary shapefile. This then allowed me to perform spatial joins to associate municipalities with the districts they fall within. 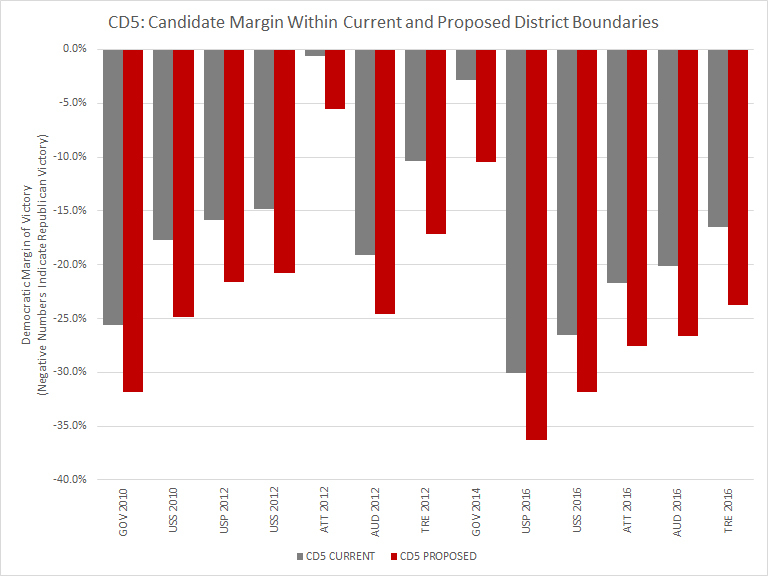 I already had a file with voter registration statistics (from November 2017) and past election performance (from 1992 through 2016) associated with these municipal level boundaries – and ward-level boundaries in Philadelphia and Pittsburgh. 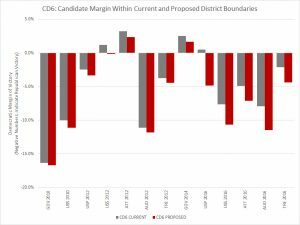 Caveat on Municipal splits: There is a margin of error on these estimates in some of the districts, because I am assigning municipalities to the proposed districts based on where the municipalities’ center points fall. 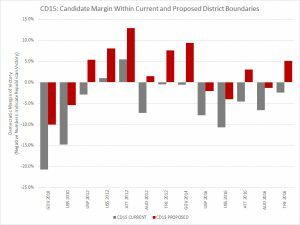 Therefore, I am not accounting for municipalities which are split between congressional districts. There are actually only a handful of split municipalities however (17 according to Senator Scarnati – I only see 13 that are obvious), and most of those municipalities are either small or are located almost entirely within the district they were assigned to in my analysis. 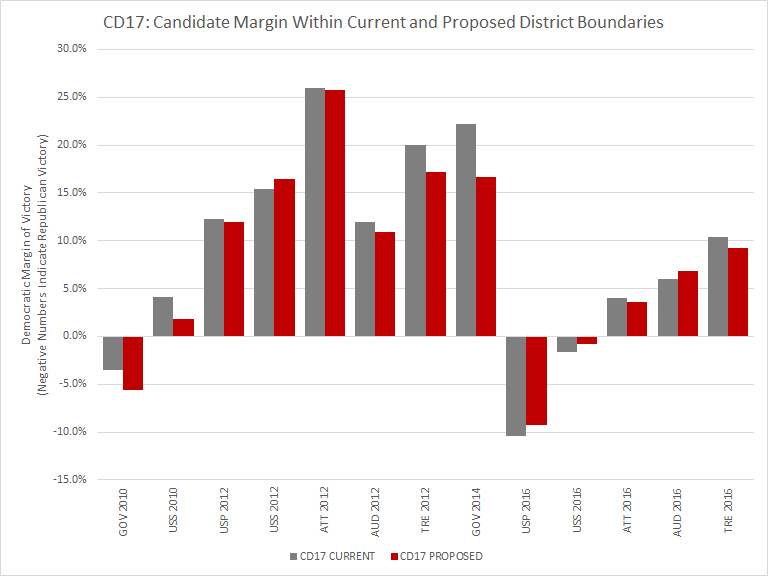 The most significant impact I can see from this shortcut would come from Upper Merion Twp, which is split almost evenly between the 7th and 13th districts, and which I included with CD7. 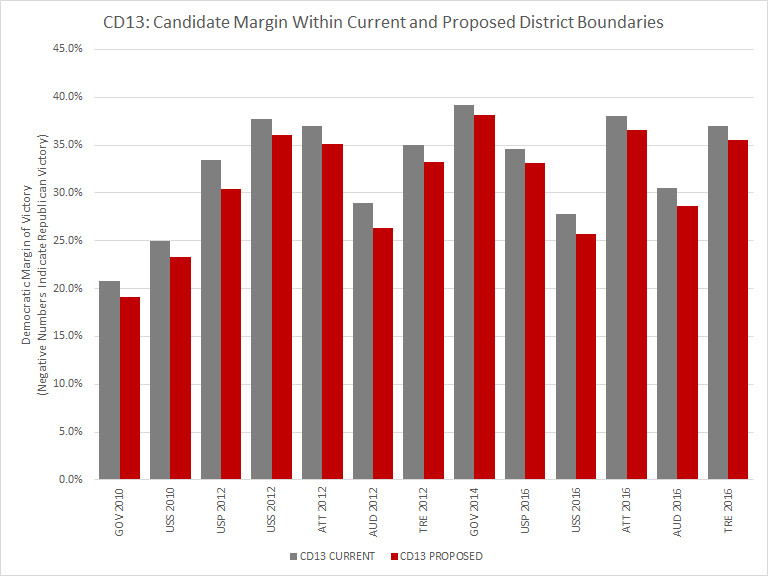 With roughly 18,500 registered voters, that’s not trivial, but I calculated that if I moved a representative half of Upper Merion voters to CD13, the registration margin would change by 0.33% in CD7 and by 0.46% in CD13. Hillary Clinton’s would change by 0.28% and 0.14% respectively. 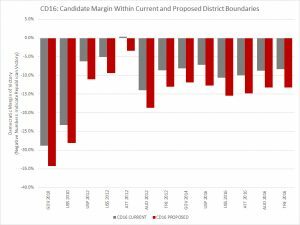 The other municipality split I see would not have nearly that large of an impact on the overall district performance estimates. If he wasn’t being kicked to the curb Meehan would still have some significant edge in the proposed 7th which really tries to serve up a Republican majority by dumping the Dems in municipalities along both rivers in SE PA. If most of you understood anything about gerrymandering, you would know that when you have areas like Philadelphia and Allegheny Counties with huge numbers of Democrats packed together, it would be almost impossible the make most of the districts competitive in the sense some of you would like to do. The map presented is better than the one that exists but there is no map that would satisfy most of you that are Democratic partisans without totally gerrymandering the state in a way that would far worse thhanything previously seen. The Supreme Court should have stayed their own order until the next census and reapportionment in 2020. It would have been the right thing to do. Sadly, the upcoming election looks like a disaster in the making since these candidates will not know their districts until the last minute so the political parties, rather than the voters will essentially be picking their preferred candidates in the new districts created. That is the real crime here. 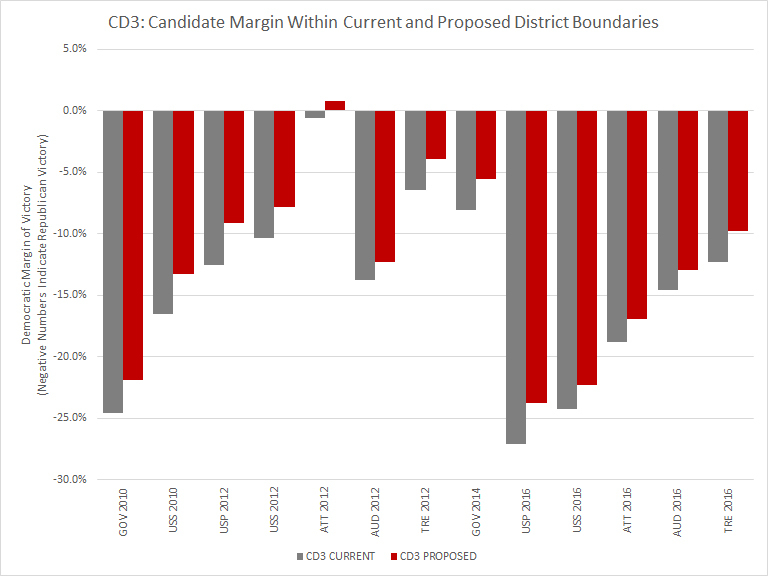 So, Mike Johnson – Why not have a chart that compares current partisan performance with new CD’s partisan performance? This post is full of a bunch of charts with information designed to deceive. Party registration is irrelevant. 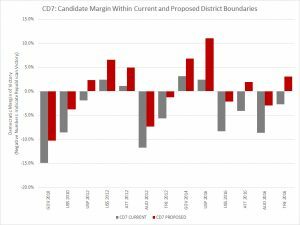 Candidate margin of victory is irrelevant given how often there are challengers in gerrymandered districts. 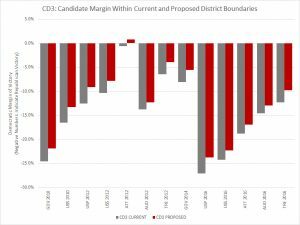 The only potentially helpful chart is the very first, but it leaves out the most important info – old CD partisan vote performance and new CD partisan vote performance. 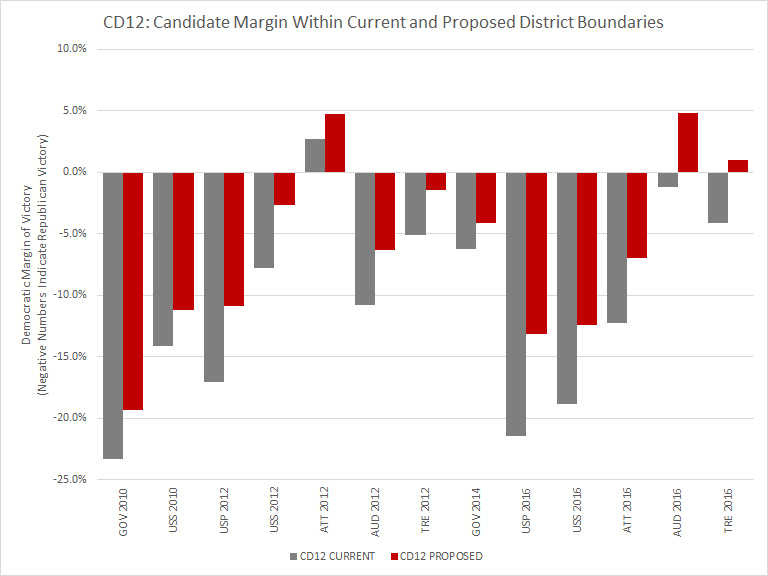 Who cares if CD 12 got more Democratic – what was its starting point, and where is it now? Apparently you didn’t read the labels on the charts or the description of the charts in the text. 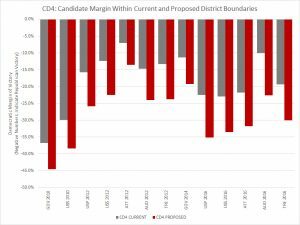 You’re talking about candidate margin of victory being irrelevant because of a lack of challengers in gerrymandered districts, when the candidate margins being compared are all for statewide candidates. I could average those results together to give you a single bar on the chart that’s average partisan performance, but I gave the extra level of detail by showing the 13 individual election results. Sorry if that makes you mad. Decent Map. Interesting that Houlahan is moved out of the 6th and into the 7th. Her campaign has gotten slapped around pretty hard by Costello in the 6th. Maybe the 7th would be an easier route. Still an overwhelmingly partisan-reliant map. 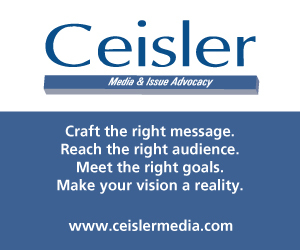 Even more packing & stacking than now – and that is what plaintiffs based their case on. Aside from the procedural misbehavior, this map is no better than what they did in 2011. 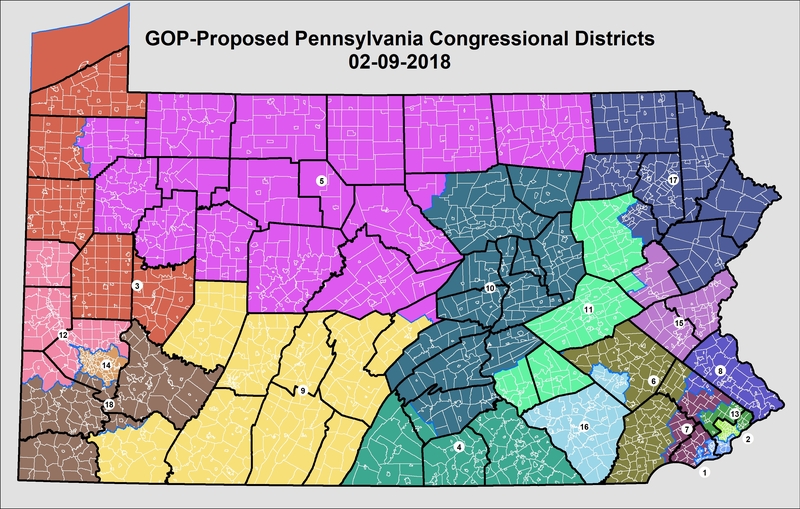 If this map is even close to what the final map is going to be, the Dems need to find a strong candidate in PA-12. Definitely winnable with a good economic message. Thanks for your efforts in creating this analysis. I plan on sharing this with interested parties. I’d like to thank Mr. Johnson for his work with these data. It makes it much clearer that change was needed. Whether this plan is adequate is up to Gov. Wolf- and I’m glad it’s in the hands of his team. I hope they are aware and consider this analysis. If this is accurate, it is an excellent infograohuc if the plan. Kudos to the author. No surprise that the GOP submit a new map that makes almost no difference. 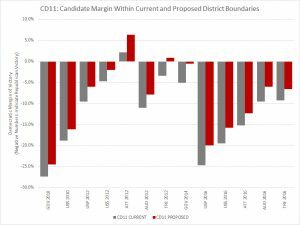 GOP even re-jiggers the SW district to eliminate Conor Lamb from it, so GOP can retain that seat in pending special election. Gee, how did that happen? There are still many gerrymandering elements to the new GOP map. Toss it and work real change with a fair map. 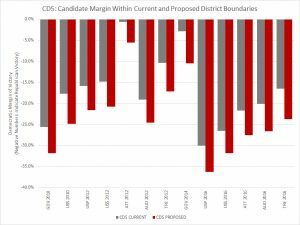 I love that Dem’s cry afoul on gerrymandering when the root of their problem is that their voters are predominantly clustered in Philadelphia and Allegheny Counties. I believe the Turzai/Scarnati map is extremely fair considering that fact. 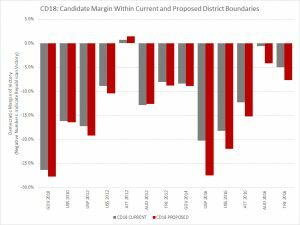 So cut up the Dem Counties like the new GOP map does to Washington County to eliminate Conor Lamb from contention there. Why does Fayette get excluded from that district, when it is contiguous to all other counties in the district? That is absolutely untrue. If you look at this bullsh*t map, you see that they push the 1st into Delaware county and have something like the boot of Italy from the 7th oozing out toward the 1st. That’s not even close to being smooth. The 1st and 2nd should be rotated counter clockwise to push the 2nd where the 13th is in NorthWest Philly, and pull the 1st out of Delaware county. So, we aren’t crying foul about the clustering of Dems in Philly. Rather, we object to extending Philly districts into Delaware county, to peel those Dems from Delco. There is simply no way to draw a map that Dems can win. There is no geographical diversity in the party and therefore no chance of getting a favorable map. It is pretty stereotypical Democrat that you guys are whining so much though. I wouldn’t recognize your party if you we’re crying about something all the freaking time. If by ‘win’ you mean that there’s no way to gerrymander a 13-5 Democratic majority in the state because of a lack of geographic diversity, then yes, you’re right. 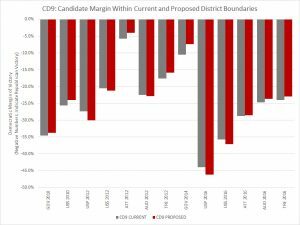 But if you are suggesting that the 13-5 Republican majority is because of Democratic clustering in Philadelphia then you are really far off. 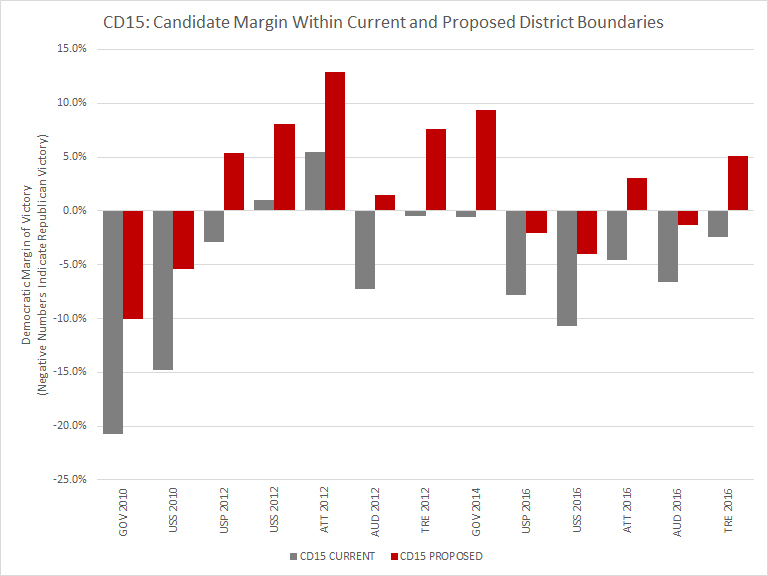 Yes, self-sorting handicaps the Dems, but that just means that a fairly drawn map in PA would probably give the Republicans a 10-8 majority when Democratic candidates are getting over 50% of the vote, and a map totally rigged by the Dems probably still couldn’t get them to 10 seats. There is no way to argue that the 13-5 majority that the Republicans have held since the 2012 election is because of where Democrats live. That just does not pass the sniff test, or the math test. This is simply nonsense, as are most right-wing comments that argue in favor of rigging elections. While it is true that democrats tend to cluster in the economic powerhouses of the state and produce almost all of the economic activity, that geographic advantage is only a couple points in a statewide context. Republicans rely on their rural welfare queens who depend on fiscal transfers from the productive cities. 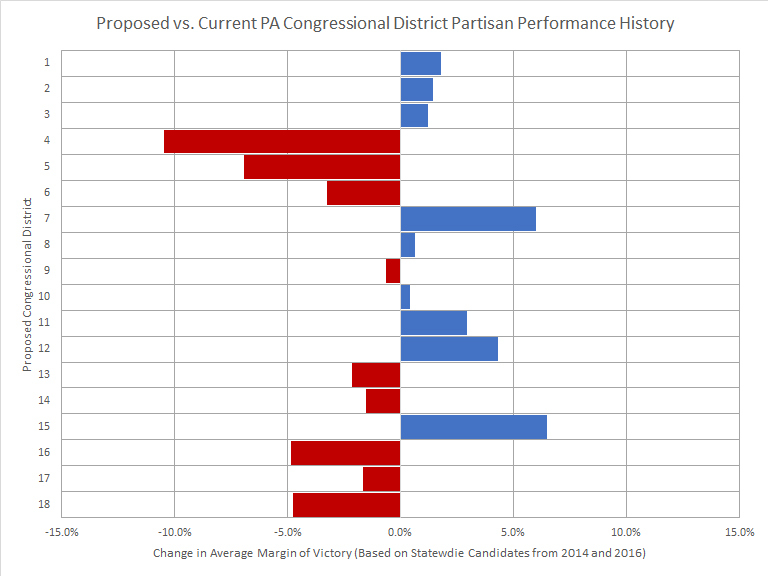 It’s completely possible to gerrymander Pennsylvania for the democrats. 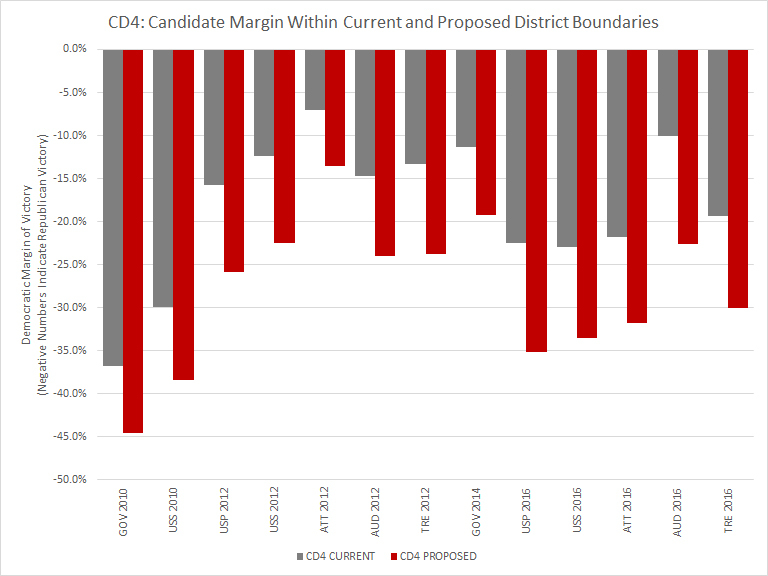 The problem for Republicans is that they simply don’t have a lot of popular support, so their districts are all balanced on knife edges, even a little shift in the lines puts a ton of seats into the competitive column. Don’t believe me, go on fivethirtyeight and they have a fun little widget that shows various gerrymandering possibilites. A democratic gerrymander could easily result in a 11-7 map, using 2016 vote totals. Hell, in 2008 the dems won a 12-7 majority. The question is just how many seats will Republicans lose in 2018, it seems pretty clear that it will be at least 5. Enjoy free and fair elections, I sure will! It’s. It about drawing a winning map, it’s about drawing a fair map. And that’s exactly what the SC will do. 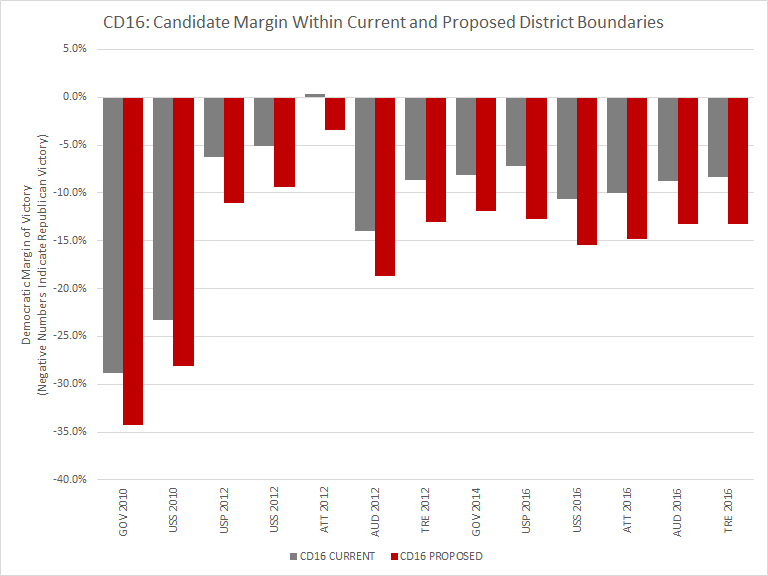 I have been reading about gerrymandered districts since 2010 and I am happy to see that we are finally getting around to making things fairer for years to come. 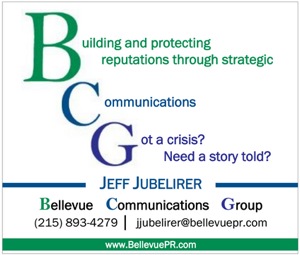 If R’s in PA are so afraid of equal representation then maybe they should just work on getting better ideas!! Look at the congressional voting records for the last 3 elections and then compare it to how many congresspeople from each party we have. Bonus for those that compare the amount of woman PA send to Washington compared to men.